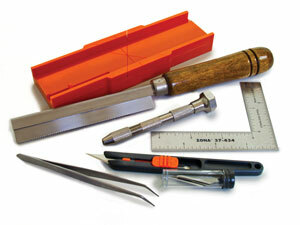 Our full line-up of miter boxes and razor saw sets has exactly what you need to get the job done. Kit includes 35-251 Mini Miter Box and Ultra Thin Kerf 32TPI Razor Saw for cutting square ends, perfect splices and mitered corners in materials 1/4″ thick or less. Also comes with 37-140 Swivel Head Pin Vise, 37-548 Curved Point Tweezers, 39-850 Retractable Knife with 6 hobby blades, and 37-434 3″ x 4″ L-Square. 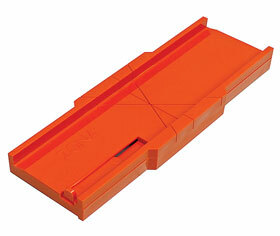 Plastic molded miter box 35-250 plus 35-200 Ultra Thin Kerf Saw (32 TPI) for cutting square ends, perfect splices and mitered corners -(has 60, 45, and 90 degree slots) in materials 1/4″ thick or less. Has adjustable stop and beveled channel for tubing and dowels. 6-1/2″ aluminum miter box has thin slots for 60, 45, 90 degree angle accurate cuts with Deluxe Handle 35-560 fine kerf saw. Saw Specs-24 TPI (teeth per inch), .010″ thick with tooth set range of .012/.014″, 6-1/2″ long x 1-3/16″ cutting depth. Made in USA. Blade is NOT Interchangeable or Replaceable. 6-1/2in. 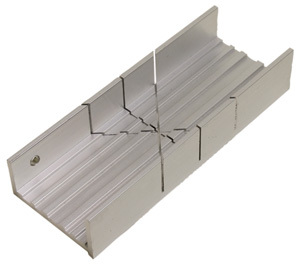 aluminum miter box has thin slots for 30, 45, 90 degree angle accurate cuts with fine kerf saw. Saw Specs: 6-1/2in. long x 1-3/16in. deep with 42 Teeth Per Inch. MADE IN USA. 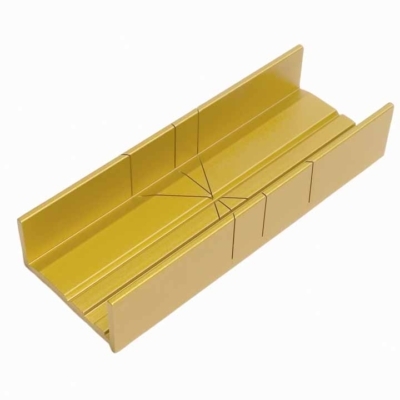 Wide Slot Miter Box may be used with any Zona Razor Saw or with junior/mini hack saws for cutting square ends, perfect splices and mitered corners. It has slots to cut 45 and 90 degree angles. Cutting Depth: 3/4″, Cutting Width: 1-3/4″, and overall length is 5-1/2″. The ‘wide’ slot is .031″ wide (compared to Zona’s much narrower 37-240 Thin Slot Miter Box  .014″ and 35-250 Mini Miter Box  .012″.